Croisière à travers la campagne toscane à bord d'une Vespa d'époque pour une expérience italienne unique au départ de Florence. 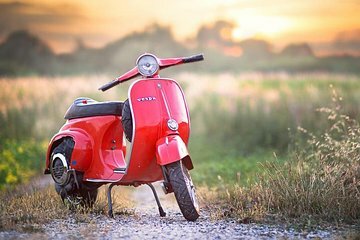 En suivant un guide en scooter le long des routes dégagées, imprégnez-vous de l'air pur et de la vue sur les collines ondulantes, les villas, les cyprès, les vignobles interminables et les oliveraies. Lorsque vous arriverez à une villa datant du XVe siècle, profitez d'une dégustation de Chianti. This was definitely one of the highlights of our trip! Nothing like driving a Vespa in and around the Tuscany hillsides and vineyards. Getting to know the details of how olives and wine are made. The wine tasting at the Villa was truly amazing!! Amazing experience and highly recommended! Mattea was our main guide for the Vespa tour and guided us through the countryside very well and was so knowledgable despite his young age! Niccoli was the guide for the Fiat tour and we combined our tours to ride through the countryside together. Recommended to have some experience riding a scooter or bring someone who has some experience, especially if you are not a natural at driving vehicles I was not a natural haha! so that at least one of you can drive. We ended at the winery with Niccoli who walked us through the wines they had and the meal to go with it. Very knowledgeable! I highly recommend touring with Mattea and Niccoli and giving them a big tip! This was such a treat. I had no idea that during the slow season that there are few places that offer this kind of tour so to have been able to book was great! Our group was really small with only three people but we all had the same experience coming into the tour, which was no scooter experience. Our guide was so great, he worked with us and gave us as much time on the private road we used to get comfortable with the scooters before we ever attempted the roads. This was one of my most favorite adventures from my trip to Italy. Absolutely amazing day, one of best tours i have ever been on. As neither of us had ever ridden a scooter before we were given an extensive training course to make sure that we were ready for the open road, i had my girlfriend on the back with me which was much easier than i thought it was going to be the two guides were amazing really friendly and really informative about the chianti regions we where driving through, we drove for a good fifty / sixty miles at least stopping to take in the breathe taking views, and then went back to an 11th century villa where they produce some amazing wines and had a wine tasting session in an original 11th century wine cellar with an arched red brick terracotta ceiling which keeps the temperature perfect for the storing the wine. It was a fabulous day and i cant thank them enough. amazing experience! lovely wine and food and the experience was so fun and definitely worth it! Best experience we had in Italy!! thanks Nicolo for being soo nice....we def look forward to coming back and booking another vespa tour with you. We recommend this tour to anyone going to Florence seeking a short but thrilling adventure! My friend and I requested our own Vespa and our accommodation was easily met. Vespa tour was amazing and our instructor was great. The wine tasting and food section was so delicious. 100% worth the money. What a wonderful experience! Truly beautiful, relaxing, informative and most importantly delicious!!! Wow, wow, wow. This was one the best times my fiancee and I had in Italy. Initially, I wasn't overly confident about booking this tour as there weren't very many reviews online when we were booking. The reason for this is because this is a relatively new experience/offering to the 500 Touring Club. They have been doing the fiat 500 tour for 2 years now and all the reviews are amazing. As for our experience with the Vespas, David was extremely thorough going through the safety briefing. He tailored it to my previous experience which was really nice. As for the tour itself, we really enjoyed the beautiful drive through the Chianti countryside. We also appreciated the chance to stop for amazing photos together with the Vespa. The food at the prince's house was absolutely amazing - cheeses and meats were top notch! The 3 wines we sampled were great and the restaurant was great as they were flexible and allowed us to order an additional meal on top of the food included. The tour through the wine cellars was a fun addition. Overall, as I said, this was one of our most memorable days in Italy - I highly recommend. Also, if a Vespa isn't for you - I'd recommend the Fiat 500 tour as a 4 wheel alternative. David and his team are extremely welcoming, helpful and a pleasure to spend the day with. Thanks 500 Touring Club.